"" Writer's Wanderings: Let it Snow--In Florida! Over the holidays, we spent some time visiting with our son and his family and were treated to a snow storm—in Florida! Homestead has an annual breakfast with Santa affair and to make it truly special, they create a pile of snow from shaved ice. I was fascinated with its creation. I’m familiar with the snow-makers up north in our area that turn our bunny hills into “ski resorts.” They spray a fine mist of water into our cold temperatures to add a cushion of snow to the slopes but Florida snow is a whole different process. Large refrigerated trucks brought in huge blocks of ice that were run through a machine which reduced the ice block to shavings of snow and spewed it out through a large hose. 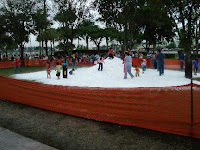 It took about an hour to create a large area of snow for the kids to play in but they were more than appreciative. In sandals and using socks for gloves, they scrambled onto the pile of snow and reveled in the feel and cold of their homemade snow that was quickly melting i n the 75 degree temperatures. The pile lasted long enough for each of the 300 kids gathered to play in it. It gives a new appreciation for God-made snowflakes.